Back and alert from the EGD scope. They did find a slightly bleeding ulcer in the duodenal loop below the stomach, as well as nonbleeding gastric ulcers in the stomach. It is believed the bleeding ulcer is healing on its own, with the stoppage of the naproxen yesterday. I am going to have more blood draws overnight, and see if my blood counts stabilize. Another blood tranfusion may be needed today, but it is hoped after that I will stabilize and be able to go home tomorrow afternoon. Hope you're able to get home soon! I'm getting to go home today! I need to make all sorts of calls to schedule follow ups tomorrow, and I have additional medications to work in to my daily regimen. Plus, I'll probably still have some discomfort as my stomach and upper GI system heals. But, I get to be in my own bed tonight, woo-hoo! Thank you all for your support, spiritually and emotionally. It is massively appreciated! Headed to my first WWE live event in nearly twenty years WWE Royal Rumble... Look out here I come! I'm getting to go home today! January is going out like a lion (is that a thing?). Snow today then brutal cold through Thursday...if you’re in the Midwest, stay warm. Skin damage can occur in 5 minutes in these temps. I'm in Ohio too and cant believe how are schools are waiting to make a decision about calling school especially with what temps are coming..We are a rural community so are kids do have to wait outside for lengthy periods of time for buses ,not including the kids that wait at cluster stops or have to walk. I drive mine but not all have that luxury. Here in ohio they no longer have a set number of calamity days..they went to a number of hours the kids have to go per year so it should not be a factor, I know our school could go 19 days less and still meet the criteria.. they are just nuts . I, too, am in NW Ohio, also in a rural community. I work in our school's cafeteria and see kids who come in for breakfast almost frozen to death. We have several walkers but in this weather I think a lot of them are finding rides to school, but not all of them are fortunate enough to get rides. Although we are no longer required to go by 5 calamity days then start making up days, our superintendent still does this. It's just insane how cold it can get outside for the kids, yet we are still going to school at the regular time instead of delaying a couple hours to see if it warms up outside a little bit. The superintendent told us last week that the wind chill has to be 20 below zero for the district to delay or cancel! 20 below!!! I was freezing this morning just walking from my car to the building (it was cold and windy but the wind chill wasn't 20 below), I can't even imagine kids walking to school in that weather. Hopefully they come to their senses and cancel school later this week when the really cold air and wind are supposed to be here. I sure hope everyone is surviving this Polar Vortex! While it's cold for us down South and I can't begin to wrap my mind around how cold it is in the MIdwest. It hurts my bones to think of temps that cold. We r hunkered down here in Ohio with negative degree temps. All schools are closed and even some businesses. My office is closing an hour early today so that we can hopefully avoid the worst of rush hour traffic. With temps this cold the road salt won’t work and things will be slick to say the least. Don't hate me - but we are going into the 70s this weekend. As we sit here with frozen water lines. Oh n it’s 12:21 in Ohio Feb 1st yahoo seems like January lasted forever. Feb: CES 2019 should give us some ideas about what Black Friday 2019 will be all about. A review of what they hope we'll buy. Uninspired by CES. CNET crowed that Apple and Samsung 'stole the show' by announcing that iTunes, Homekit, and Airplay would be available on some Samsung televisions. Apple wasn't even at the show except for a sign that declared 'What happens on your iPhone, stays on your iPhone.' Believe that? Me neither. (see http://www.startribu...-app/505087752/ and https://www.msn.com/...es/ar-BBSZqui) Sony showed a beer-holding-karaoke-party-speaker...because it's a good idea to set alcoholic beverages on top of electronic devices, i guess...in Japan. Best quote of the show came from The Verge, "Kohler’s Numi 2.0 Intelligent Toilet is one of those strange products that draws so heavily on buzzwords and tech trends that it’s indistinguishable from parody." Google Home and Alexa enabled, the intelligent toilet is part of Kohler's smart bathroom. Speakers, moodlighting, and a bidet, but no medical analysis. The Japanese have been taking stool samples at home for two decades. Alienware demo'd a $2,549 i7-8700, RTX 2070, 1TB, 8GB of DDR4, 1080p 60Hz laptop. With the possible exception of the display, all of those components are upgradable. No guarantees that anyone will make components that will fit, but my shorts are getting a little tight. Still boring. Edited by len_mullen, Feb 1, 2019 - 12:38 am. Thank HEAVEN it's February. January seemed like the longest month ever. I was home 3 days this week because of snow and the deep freeze and thought I was going to go stir-crazy. Happy February everyone! Yay ..tomorrow is Ground hog day! I know it's silly but I love watching that movie all day long..I'm totally weird. Checking in for February.....BHM....and the month for LOOOOOOOVVVVEEEE! Trying to think of something creative to bring to the thread for this month, but I think my brain froze recently with the cold weather. Not as bad as Minnesota, but still a couple days of negative temps and wind chills was bad enough for me. Luckily it could hit 60 this weekend, so by then I should thaw out some. I'm just a dude trying to find a good deal. Kansas City Royals fan since birth. Even the bad years! Third day of no school this week and our water lines at home are still frozen. How long till summer?! 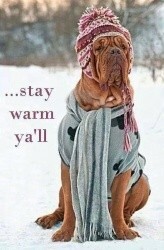 We've been having some cold mornings in Oklahoma, but nothing like other people are describing! Makes me feel bad for complaining Sending up prayers for warmth! Stay safe those of y'all in the frozen areas! Well, we made it through the extremely cold week. In a few days, it is going to be about 80 to 90 degrees warmer than we just had, when you factor in the wind chills. CRAZY!!! Len - I really envy the fact that some people have no tv bill. Unfortunately, my husband loves his tv too much to change anything. I HATE paying the tv bill. I rarely have them even on when he's not home. 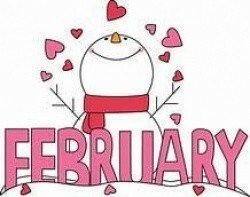 February already!! Heatwave predicted for this weekend!! !